BRING YOUR LEGACY TO LIFE. REDEFINING STATE OF THE ART. REDEFINING STATE OF THE ART. REDEFINING STATE OF THE ART. REDEFINING STATE OF THE ART. REDEFINING STATE OF THE ART. REDEFINING STATE OF THE ART. LETâ&#x20AC;&#x2122;S TALK ABOUT THE BUILDING. REDEFINING STATE OF THE ART. REDEFINING STATE OF THE ART. REDEFINING STATE OF THE ART. REDEFINING STATE OF THE ART. 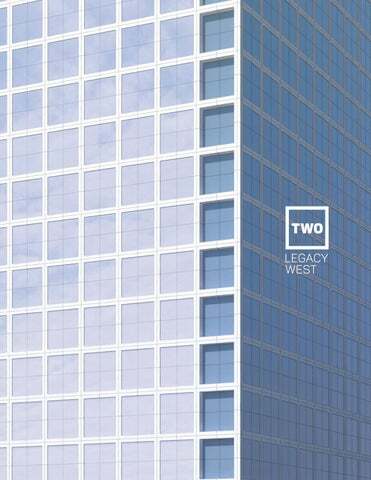 wo Legacy West will be a Class AA, five-star office tower located in the booming Legacy West area of Plano, next to the breathtaking One Legacy West. Situated on the corner of Leadership Drive and Sam Rayburn Tollway, Two Legacy West is adjacent to JPMorgan Chaseâ&#x20AC;&#x2122;s new campus, the new Toyota headquarters and the FedEx campus. The building will feature 15-foot floor-to-ceiling windows and stunning 360-degree views. Two Legacy West will build upon the internationally recognized design success of One Legacy West – featured in Interior Design magazine as one of five global office spaces that employ artistry and imagination and named by Texas Architect as one of its 2018 Design Award featured projects. Described as “an act of restraint and clarity,” One Legacy West set the design standard in Dallas’ northern suburbs, and Two Legacy West is an extension of this vision. The building’s common areas will include artwork curated by local gallerists, stunning modern furniture and state-of-the-art connectivity. OFFICE IN THE PATH OF GROWTH. OFFICE IN THE PATH OF GROWTH. OFFICE IN THE PATH OF GROWTH. OFFICE IN THE PATH OF GROWTH. OFFICE IN THE PATH OF GROWTH. OFFICE IN THE PATH OF GROWTH. WHY MOVE TO LEGACY WEST? OFFICE IN THE PATH OF GROWTH. OFFICE IN THE PATH OF GROWTH. OFFICE IN THE PATH OF GROWTH. OFFICE IN THE PATH OF GROWTH. IN THE MIDDLE OF ALL THE ACTION LEGACY WEST At the epicenter of Plano’s monumental growth lies Legacy West, an urban development lined with coveted retail, dining, hotels, residential properties and office buildings. The area has no shortage of restaurants, including the world-renowned Legacy Hall food hall. Even though it opened this past fall, Legacy Hall has already been named the No. 2 food hall in the nation. THE SHOPS AT LEGACY The Shops at Legacy is a two-minute drive from One and Two Legacy West. There, you will find a shopper’s paradise of upscale retailers, beauty services, and every restaurant a foodie could ever hope to experience. GRANDSCAPE Grandscape is one of the newest mixed-use real estate developments in Dallas. Backed by Warren Buffett, Grandscape is home to Nebraska Furniture Mart, a retail phenomenon spanning over 100 acres. Additionally, Grandscape has over 400+ acres of planned retail, restaurant, entertainment, office and residential developments. THE STAR Just north of One and Two Legacy West is the home of the Dallas Cowboys’ practice facility – The Star. The Star is a 91-acre sports and entertainment district in Frisco featuring a 12,000seat indoor stadium; a 60,000-square-foot gym; a brand-new, state-of-the-art sports therapy center; and the Omni Frisco Hotel. AUSTIN RANCH Southwest of One and Two Legacy West lies Austin Ranch, a 1,700-acre master-planned community with apartment complexes, single-family homes, and retail, office and industrial spaces. The area is home to one of the newest restaurant and retail concepts in Dallas – The Shacks at Austin Ranch. The Shacks consists of six restaurants that share a large, open-air, dog-friendly patio and dog park. WE’RE MAKING IT A DOUBLE. WE’RE MAKING IT A DOUBLE. WE’RE MAKING IT A DOUBLE. WE’RE MAKING IT A DOUBLE. WE’RE MAKING IT A DOUBLE. WE’RE MAKING IT A DOUBLE. EXPERIENCE IT FOR YOURSELF. WE’RE MAKING IT A DOUBLE. WE’RE MAKING IT A DOUBLE. WE’RE MAKING IT A DOUBLE. WE’RE MAKING IT A DOUBLE.